When using Advanced Mode to create an SD card, either by creating a new show or editing an existing show, the SD Card Wizard will appear. Depending on the Director selected, if this is a new show or not, and other options, some of these steps may not appear or some options may not be available. 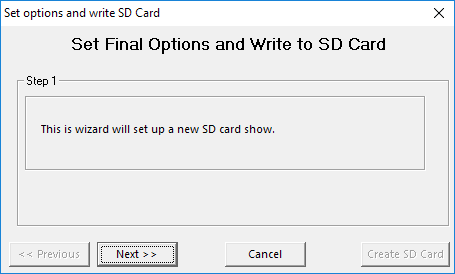 When editing an SD card, the options here will default to the options of the current show on the card. Selecting Yes will search your computer for the sequence originally used to create the SD card. If it is found, any changes in the sequence on the computer will be moved to the SD card. This is recommended. Selecting 'Ask' will prompt you for each sequence that is found on the computer that is also on the SD card. There you can select yes or no. 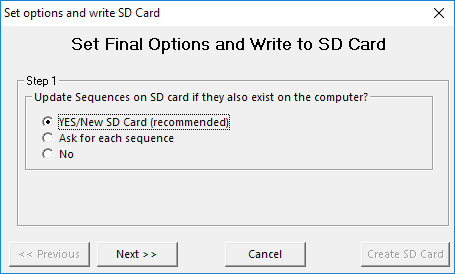 Selecting 'no' will leave the existing sequence on the SD card as-is. No changes from the computer for that sequence will be moved. As of this release there is nothing to be done at step 2, so it is always skipped. In a future release this will change. If you have a G3MP3 director, select the check box here, and then specify the number of ports for your director. 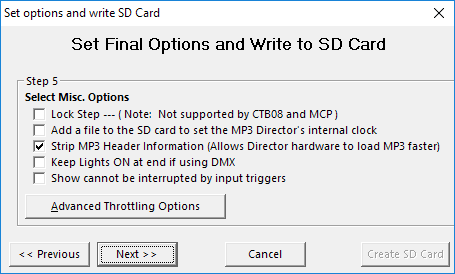 This is what LOR Networks and/or DMX Universes the SD Card Wizard will write to the card, based on the priority system. 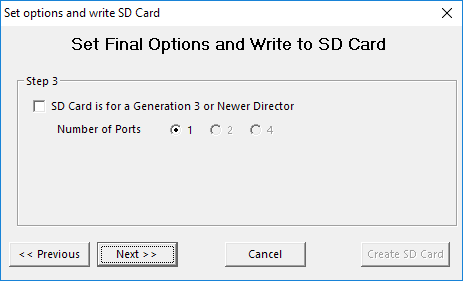 If the PC you are creating the SD card on is already properly configured to run this show, you can select this check box. When selected the Wizard will attempt to use the PC's network settings when creating the card (Speed, Enhanced LOR, etc). Even when selected, you can change the settings in option 6. •Lock Step: If you have a very large display, selecting "lock step" may help the different controllers used in the display react with a higher degree of synchronization. This is not supported on all controller types, and the level of firmware in the controllers must be 3.0 or higher. •Set MP3 player's internal clock: If you wish to add a file to the SD card to set the MP3 director's internal clock, check the box that says so. Note that there are also other ways to set the director's clock. •Strip MP3 Header Information: Some MP3s may have a large data block before the actual music data. For example, an MP3 may have several high-resolution pictures in its ID3 Tags. The MP3 director will correctly ignore this data, however it does take time to find the actual start of the music file. Stripping this data will allow the MP3 director to start playing the sequence faster. •Keep lights ON at end if using DMX: Previously if one or both ports were controlling DMX Universes the MP3 director would always shut off all the lights. Checking this box will allow channels in DMX universes controlled by the MP3 director to remain in the last state they were sent. If you leave a light on at the end of a sequence, that light will remain on until the start of the next sequence. •Show can not be interrupted by input triggers: Once this show has started on the MP3 director, pressing an input will not interrupt the show - it will run to completion. •Advanced Throttling Options: The advanced options button will bring up an additional window that allows you to change parameters which relate to how data will be transmitted from your MP3 Director. Unless a specific issue is preventing your MP3 Director from working correctly, you should not change these options. Communications port setup is done on step 6. For each port your director has, you will be presented these options. So for example if you have a G3MP3 Dual Network director, you see this dialog twice. Once for the fist physical port, and then again for the other physical port. Depending on the type of equipment you have, your LOR license level, and/or the contents of your sequence, one or more of the options here may not be available to you. If in Step 4 you selected that you would like the MP3's director ports set up the same as this PC, those values are loaded and used as the default here. You can further change them if the need arises. Select the communications speed that will be used to broadcast lighting commands. The recommended setting (57.6) will suffice for many users' displays. If you have many controllers that are far distances apart, a slower speed may help; if your sequences use many rapid lighting commands, a faster speed may help. •G3 directors (and higher) have additional speeds of 500K and 1000K available. The 500K speed is approximately four times faster than the previous high speed of 115.4K, but is only supported on Generation 3 (G3) devices with updated firmware. •The 1000K speed can ONLY be used with networks that only contain PixCon16 controllers or Pixie family controllers. No other LOR controllers support 1000K. •For directors that have multiple ports, you can specify a different speed(s) for each port. The MP3 Director will keep both networks synced even if your show uses multiple ports at different speeds. •If your license supports Enhanced LOR Protocol and you are creating a card for a G3 or above director, an additional option may be available depending on the first sequence loaded. If the first sequence has both Normal LOR and Enhanced LOR commands available, you can select if you want BOTH to be written to the card (checked), or if you only want Normal (unchecked) commands written. If you do not have a G3 controller, or you do not have a license that supports Enhanced LOR protocol, or if your sequence does not have both types of networks, then this option is not available. There is no option that will allow for only Enhanced commands, even if your sequence has both available. DMX Universes run at a fixed speed, and therefore the options to change port speed are not available. This final step will allow you to review how the SD card will be configured when written. If you are satisfied, press the 'Create SD Button'. Once the card has been completed, you'll be notified.